__Phablets, once mocked for their large size, may be the next big form factor dominating mobile devices, if new data from the holiday season is any indication. Flurry Mobile, part of Yahoo’s mobile analytics division, published two reports about phablet devices at the beginning of the new year, showing their continued growth and that people use them more than traditional or smaller mobile devices. The percentage of new phablet-sized phone activations during the 2014-2015 holiday period more than doubled to 27% from 13%. Compared to 2013, phablet activations have increased more than 4 times—jumping to 27% from 4%. 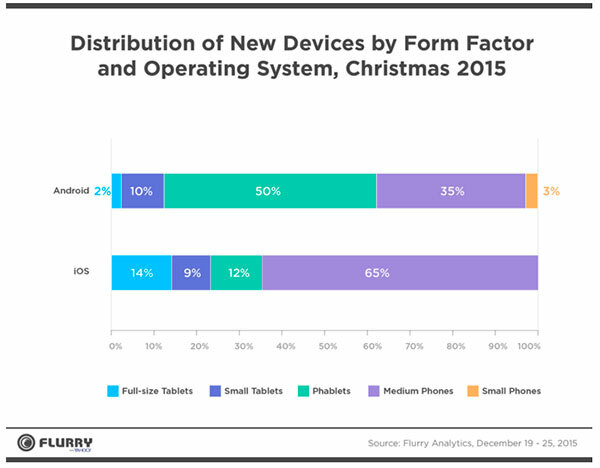 Specifically, Android devices are driving this larger form factor, making up 50% of all new device activations over the 2015 holidays in the phablet-size range. Much of this growth cannibalized tablet and medium-sized phone activations and points to the continuing trend of tablet devices plateauing in popularity. A week later, another report cited how average mobile app usage grew more than 58% year-over-year. 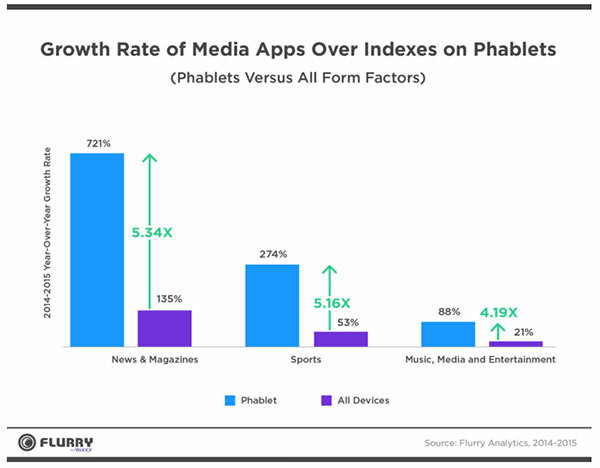 Phablets contributed to this growth: phablet users spend 5.34 times more time in news and magazines apps, 5.16 times longer in sports apps and 4.19 times longer in music and other media apps. The extra inch or two of screen real estate makes phablets exponentially more appealing for longer usage, compared to smaller phones. Flurry also projects this trend will continue as more and more people upgrade to phablet devices; they’re predicting that by 2017, phablets will be the majority mobile phone size.